Our stay in Ecuador has allowed us to meet people and see many things that have interested and brought enjoyment to us. 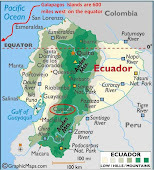 These aspects of Ecuador were expected and are some of the reasons we are here. However, the places we have been in southern & eastern Ecuador have consistently been highlighted by “grand views” or “scenic vistas,” so this blog is solely devoted to some pictures that may illustrate the scenic views that we have found so exhilarating. Enjoy. View from Turi overlooking Cuenca: note the three blue domes of the "New" cathedral - the icon of Cuenca. The line of trees going horizontally through the picture is the Rio Tomebama and the wide street starting at the bottom of the picture is Solano Avenue. View from Ingapirca - perhaps one of the reasons the Incas built their temple to the Sun there. Another day and another view at Ingapirca. Rain Forest at Yachana Lodge with a volcano in the distance. View from the Panamerican Highway heading south to Saraguro. View on hike to Inca nine strategic peaks. Another view on hike to Inca strategic peaks.